In Search of My Mother's Garden: "NEW PROJECTS"
This week I started on a new project to develop an area located between the side garden and what has been in the past my vegetable garden. It is a pretty shady area with two tremendous pine trees, an October Glory Maple, and a very old Crepe Myrtle (Natchez I believe) which I planted 23 years ago. A path to the vegetable garden divides the space. Last year I developed the left side under the pine trees with hydrangeas and Clerodendrum bungei also known as rose glory bower or Mexican hydrangea. I had done a little work on the right side removing some old shrub roses. and a nice stand of spiderwort. Needless to say, I was a little intimidated when I first looked at the area this past week and had second thoughts about whether I really wanted to do it or not. Finally I got motivated enough to get started then went into full throttle mode to get the job done. I had planned to haul off all the debris this weekend but alas the rain Gods decided otherwise. This is what the area looked like before. I do not have a plan yet for this space, I just needed to remove the clutter and clear the slate more or less. The canopy of the October Glory covers most of the area so shade plants should do fairly well here but there is some late afternoon sun that penetrates the area. I plan to study the area and determine how much sunlight it receives and go from there. I will keep you updated as the area progresses. I had started some tomato seedlings a while back that I purchased at the Home & Garden show. I bought Black Krim and Brandywire heirloom tomatoes. Last week I transplanted the seedlings to larger pots. I plan on thinning them out tomorrow. I constructed three more SWC's and added some cucumbers, a black beauty eggplant and a white eggplant. Today I was at Sam's and saw a raised bed kit made from wood composite with the dimensions 84"x 42"x8" for $40.00. Having priced wood at Lowe's and Home Depot, I figured this was a pretty good deal and bit the bullet and purchased two of the kits. The kits are extremely easy to put together and if I were blessed with a level piece of earth in my yard I could have finished it in about 5 minutes. But alas, nothing is ever easy for me, so I had to level the area first. I wanted to enclose the Lasagna plot I developed last year so I outlined the bed, leveled it with old brick and put the frame together. I'm rather pleased with the results. I decided not to add any more soil in the raised bed since the soil is very rich and has a lot of worm and microbial activity already. At the end of the season I will add more layers to the Lasagna bed and bring it up to the level it needs to be and let it cook until next spring. Currently I have three squash plants and two okra plants that I purchased today. It is called "Little Lucy" and is a red okra. It only grows 2 feet tall and tends to be bushier than typical okra. Last saturday I planted some rattlesnake pole beans and noticed today that some sprouts are emerging thru the soil. Common Name: St. Joseph's Lily, hardy amaryllis. Color: Bright red flowers with white stars at the throat, very fragrant. 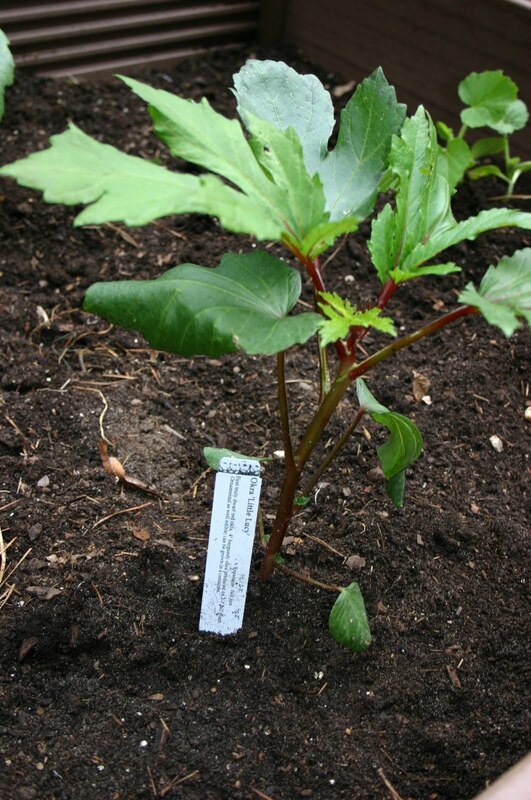 Hardiness: Zone 7-10, probably to zone 6 with protective mulch. Bloom Time: Late spring, early summer. Black & Blue Salvia and Salvia Argentina Blue Skies. 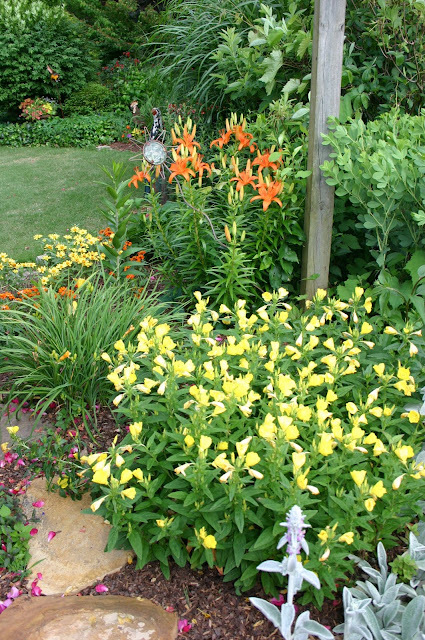 Evening Primrose(Oenethra) and Asiatic Lilies. The Torch Lilies are almost spent. I was late taking a picture this year. It's a great plant and I like it a lot. Well it's been a busy week in the garden. A lot of progress has been made but there is still a lot more to do. A gardener's work is never done.